The Department of Culture, Heritage and the Gaeltacht is currently finalising the draft Threat Response Plan for public consultation on pressures facing populations within Special Protection Areas designated for breeding Hen Harriers. This follows earlier consultation with the stakeholder representative Consultative Committee in May of this year, which generated considerable feedback regarding – among other issues – proposals for limited afforestation within the SPAs, according to the Minister for Agriculture, Michael Creed. He also confirmed that until the Threat Response Plan is completed, his Department will not be in a position to approve afforestation projects within the SPAs. 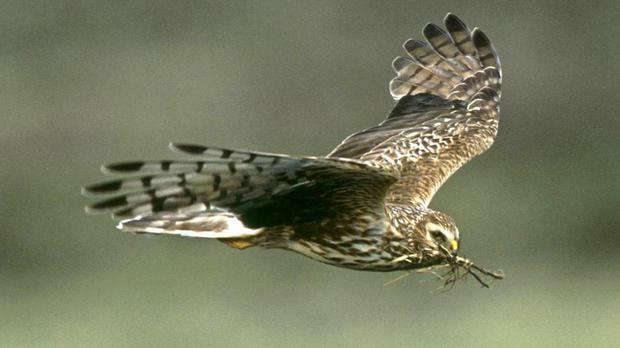 Some 2,657 farmers currently have Hen Harrier actions under GLAS, covering 42,216 hectares of habitat. The Minister also said that the overall aim of the European Habitats Directive is to maintain or restore the favourable conservation status of habitats and species which are threatened throughout Europe and deemed highly sensitive to change. ” These habitats and species are listed in the Habitats Directive and the Birds Directive. Special Areas of Conservation, or SACs, and Special Protection Areas, or SPAs – also known as Natura sites – are designated to afford protection to the most vulnerable of these habitats and species. As such, SACs and SPAs are a key component in the protection of rare and endangered habitats and species, both in Ireland and at a European and international level. To tackle the decline of Hen Harrier populations in Ireland, a process has been underway since 2015 to develop a Threat Response Plan. “This process, led by Minister Madigan and the Department of Culture, Heritage and the Gaeltacht, focuses on the key land uses of agriculture, forestry and wind farm development. He also said that any afforestation within a Natura site must satisfy Article 6(3) of the Habitats Directive, and must also be agreed to by National Parks & Wildlife Service. In the overall context of my commitment to addressing the decline of the Hen Harrier, I would point out that I fully recognise the importance of the preservation and conservation of the Hen Harrier and other protected bird species. Under the Rural Development Programme 2014-2020, for instance , the Green Low-carbon, Agri-environment Scheme (GLAS) gives priority access to landowners in SPAs and supports them in adopting farming systems suitable to the protected species. His Department is also funding a Hen Harrier Programme under the European Innovation Partnerships (EIP) measure.